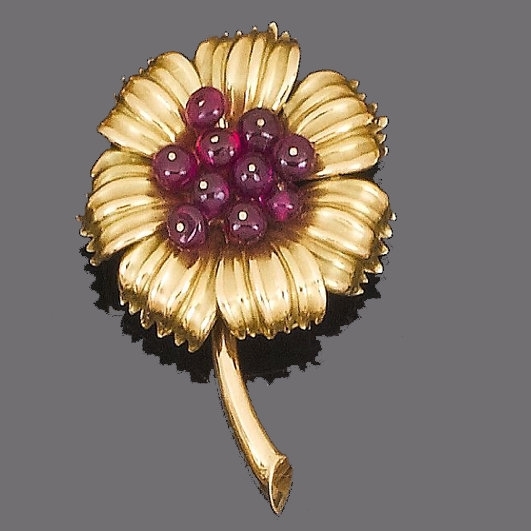 The story is truly fantastic: imagine a dusty ruby brooch bought in a charity shop for £1.50, and sold for an amazing £2,400 after being identified as valuable vintage jewellery by experts at Bonhams auctioneers. The incredible provenance of the flower brooch – found in a basket of ordinary jewellery items – was finally revealed after ‘scratches’ on the back turned out to be a Cartier signature. The valuable antique piece was rescued from a Cambridgeshire charity shop after its buyer decided she rather liked the pattern. Immediately, she decided to get it valued and, after the leading international auctioneers identified it as by Cartier, it sold to a collector for a staggering 1,600 times its purchase price. This ruby brooch is part of a whole ensemble of forgotten jewellery worth an estimated £60 million that is gathering dust in drawers and attics across Britain. Other incredible finds range from a £20,000 diamond ring buried in a back garden; an art deco brooch bequeathed to a young girl by her grandmother and considered ‘costume jewellery’ until it was valued and sold for £12,500; and a ring inherited from a client’s grandmother that was revealed as an ultra-rare Burmese unheated ruby which sold for £134,500. A 4.50 carats single-stone ruby ring inherited from a client’s grandmother was brought in from Cambridgeshire. After Bonhams sent it away for testing, it turned out to be an ultra-rare Burmese unheated stone which sold for an eye-watering £134,500. A Burmese Ruby Single Stone Ring. Another client produced a 5 carats brilliant cut diamond in an early 20th Century ring mount that his mother had buried in the garden in a jar then died without telling him where it was. Incredibly, he had spent a year digging over the garden before finding it. The ring was eventually sold for £20,000 by Bonhams London. A gentleman from East Anglia brought in a bright green bangle for valuation. This was identified as jade with an estimate of £20,000-£30,000. Bonhams went on to sell this in its Hong Kong salesroom for £443,500. An art deco multi-gem brooch bequeathed to a young girl by her grandmother was considered ‘costume jewellery’ and used as a dressing up toy at home in Wiltshire. Valued by Bonhams, it was revealed to be Cartier and sold for £12,500 to a private collector. Another client organising his late mother’s belongings found a five shilling note sewn into a curtain hem. Spotting a bulge in the lining, he uncovered an antique amethyst necklace which was sold by Bonhams for £6,000. An elderly lady brought in a bag of predominantly costume jewellery to be valued by Bonhams in Knightsbridge, London. Among the collection was a ring set with a light blue stone. It was a rare blue diamond and later sold for £100,000 to a Swiss collector. Fancy Coloured Diamond Single Stone Ring. Post edited by Claudia Carletti, Jewellery Through Time. All material courtesy of Bonhams.